This five-day itinerary allows you to explore many of the wonders of Iceland. One of the most visually stunning countries on the planet, you’ll see exploding geysers, free-flowing waterfalls, geothermal spas and glaciers – the list goes on. On this itinerary, you’ll go in hunt of the Northern Lights as well as experiencing the warmth of swimming in the world famous Blue Lagoon. You’ll choose from a number of different itineraries allowing you to tailor-make your perfect Iceland adventure. Upon arrival into Iceland, we’ll arrange for a private transfer to take you to your hotel. You’ll be staying in luxury and sophistication in the heart of Reykjavik which will be your base from where you’ll explore this incredible country. This evening, if suitable, you’ll embark on your hunt for the Northern Lights. We’ll schedule this trip on the night with best visibility. The tour includes a wonderful two-course meal and a visit to geothermal baths. This tour is all about flexibility and fun. Mother Nature is our boss and we follow her lead. You will be picked up from your hotel in Reykjavík by your very own Out Of Office guide. Together you will embark on an adventure to the southern or western part of the country where you will try to track down the sometimes elusive Aurora Borealis (The Northern Lights). Your guide will tell you about the area you cover while on the way and answer any questions you may have about Iceland, its culture and history. This tour takes you to some of the most beautiful places in Iceland, seldom seen in the dark by those who visit the country. Your guide will do his or her best to make sure you find the Northern Lights. If you don’t, we promise that by the end of the tour you will still have had a great time, in great company and eaten some great food. We will always be honest with you about the probability of Northern Lights. This morning you’ll embark on a two-hour city walk. 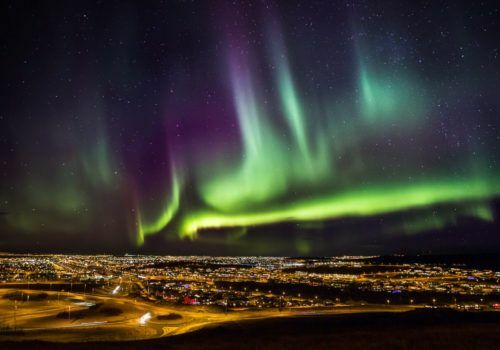 Get to know Reykjavík and her history with in this great introduction to the fabulous city. During the tour Reykjavik’s main attractions are highlighted on foot with guide. You’ll make your way to the old centre of town where you’ll see Parliament, Iceland’s Cathedral, Iceland’s first (and oldest) street, Reykjavík’s oldest house (which used to house a gay bar) and loads of other cool sites. For LGBT guests, we’ll pay particular attention to how and where gay history in Reykjavík began, how the battle for equality has evolved through the years and where we are at now. See the venues frequented by LGBT people throughout the years and learn about the general history and outlook of the people who built Reykjavík and those who inhabit it today. Our guides encourage you to ask questions and they often joke that if they don’t know the answer Icelanders are good storytellers and can probably come up with an answer more interesting than the facts! In the afternoon you’ll head to the world-famous Blue Lagoon where you’ll spend a relaxing few hours bathing in the geothermal waters and perhaps, if you like, enjoying a spa treatment. You’ll return to your hotel where the evening is yours at leisure. Choose from either a tour of the Golden Circle or opt for the South Shore Safari. You will get the chance to walk around the world-famous Geysir geothermal area, a geothermal field with hot springs in abundance, an erupting geyser and pools of bubbling mud. This is followed by a visit to the magnificent Gullfoss waterfall where the power of the water can be felt through the air. The penultimate stop is at Thingvellir national park, the site of the oldest parliament in the world where the great Atlantic rift is clearly visible, a rift that is slowly tearing Iceland apart along tectonic plates. After breakfast you’ll be picked up from your accommodation and driven over the flat lands of South Iceland which are considered to be the breadbasket of Iceland. Beautiful countryside with countless farms and beautiful mountain ranges and volcanoes in the distance. Drive past the beautiful black beaches from where you can see the Westman Islands, Iceland’s southernmost point. Afterwards you’ll drive along old sea cliffs where hundreds of waterfalls can be spotted. Behind the mountains lures Eyjafjallajökull the dreaded volcano that erupted in 2010 and stranded millions of people all around the world. Your first stop is at Seljalandsfoss, the waterfall you can walk behind and we walk to the hidden waterfall Gljúfrabúi. Next we stop at the beautiful black sandy beach of Reynisfjara and have light lunch there. Then it’s on to the small and charming village of Vík. On the way back we stop at the stunning rock formation of Dyrhólaey and the last stop will be the magnificent Skógafoss a 60 meter clear stream waterfall. The South Coast of Iceland has everything you want to see in Iceland: waterfalls, glaciers, beach, volcanoes and beautiful mountains. This wonderful day tour introduces you to the wonders of the Snæfellsnes Peninsula – one of the most picturesque places in Iceland and the inspiration for Jules Verne’s Journey to the Centre of the Earth. The trip takes you around the whole peninsula with plenty of exciting nature stops where you will experience, amongst other things, a beautiful black pebble beach, stunning cliffs, amazing birdlife, important historical sites, lava fields, and much more. We’ll stroll around the beautiful Stykkishólmur village and have a light lunch. We continue on to the village of Grundarfjördur to see the beautiful mountain of Kirkjufell. We then drive on to the National Park of Snæfellsnesjökull Glacier where we explore the wonders of the peninsula and see the coast line and lave fields around. We see the beautiful cliffs, Lóndrangar and the beach of Djúpalónsandur. We drive to Hellnar village where we explore the coast line and it‘s beauty. You’ll have the option to have a light dinner there, or a glass of wine, or both. On our way to Reykjavik we stop by a beautiful white sandy beach and try to spot seals or bird life in this beautiful part of Iceland. After picking you up from your accommodation we head towards Hvalförður (Whale Bay) where we’ll see the ruins of the fjord’s whaling facilities as well as learn about the british occupation of Iceland during WW2. Next we drive over the Skarðsheiði heath to Deildartunguhver – the highest flow hotspring in Europe, pumping out hot water at the rate of 180 liters pr. second. Next up is a stop at Reykholt to where Snorri Sturluson lived. Sturluson wrote the Edda poems, one of the foundations of Norse Mythology and an invaluable source of knowledge of life in viking times. Next up is a visit to the Hraunfossar, a series of waterfalls formed by rivulets streaming over a distance of about 900 metres out of the Hallmundarhraun lava field. A short walk upstream you’ll find the beautiful and well known Barnafoss (Children’s Waterfall) and learn about the harrowing story of how it got its name. We carry on to Húsafell and the Langjökull glacier where you’ll have the option of going snowmobiling or glacier hiking. After the excitement of the glacier we’ll visit Háafell a local goat farm dedicated to the cause of maintaining the icelandic goat species. We’ll taste the farmer’s produce and pet some pretty goats. Next stop is Borgarnes where we finish our trip at a local museum about the Icelandic Sagas. From Borgarnes we take the Whale Bay Tunnel back to Reykjavik and drop you off at your accommodation.